This year during lunchtimes ,we will be running a range of PE clubs for KS2 children linked to the Sainsbury's School Games initiative. A range of sports clubs will run each half term, encouraging children to learn a new sport/activity and give them the opportunity to partake in a range of intra competitions at the end of each half term, this will also help to inform our selection for the Level 2 inter competitions . The clubs will be booked using a self sign up system, displayed on the Sainsbury's School Games sports board. So far, the self sign up system has proven extremely popular leading to all the lunch clubs for this half term being fully booked. The lunch clubs for this half term will be tennis, girls football and athletics. 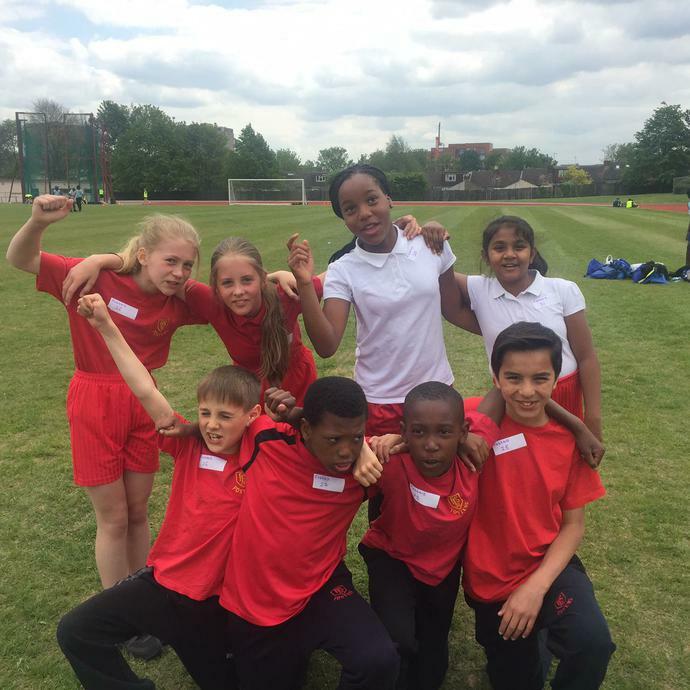 This half term, year 4 have participated in the Welling School sports day where the children had a fantastic day participating in a wide range of fun and exciting sporting activities. Some of the activities included step aerobics, basketball, kickball, relay, dodge ball and an obstacle course. The school was awarded a trophy for their participation and one child received an individual trophy for his determination and courage in all of the sporting events. This summer half term has also been a very busy term for competitions, both level 1 and level 2. 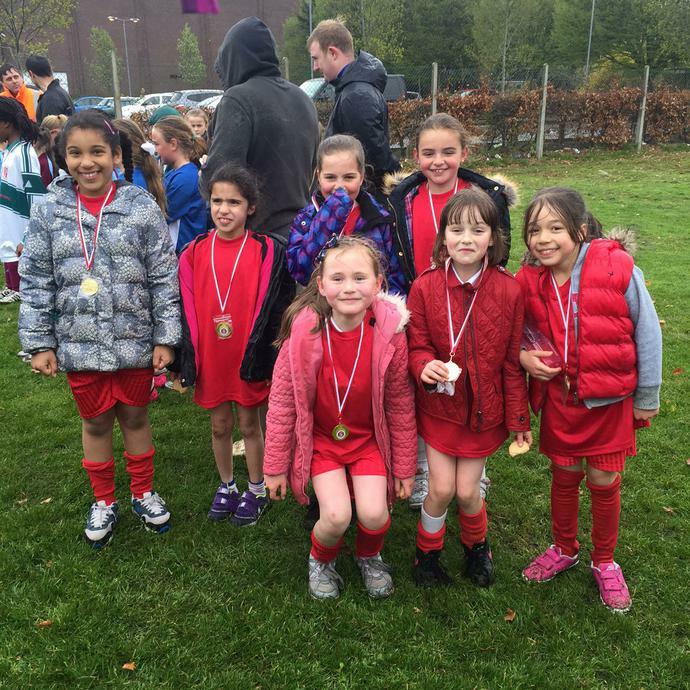 A huge congratulations to our Year 3 and 4 girls for their first level 2 football tournament. 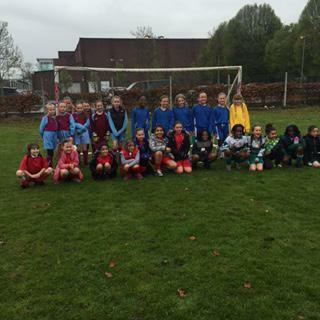 After a very wet and windy evening, the girls showed fantastic determination and improvement throughout the competition! Also, a big congratulations to the year 3 and 4 children who competed in the Mini Tennis at Beths Grammar School. 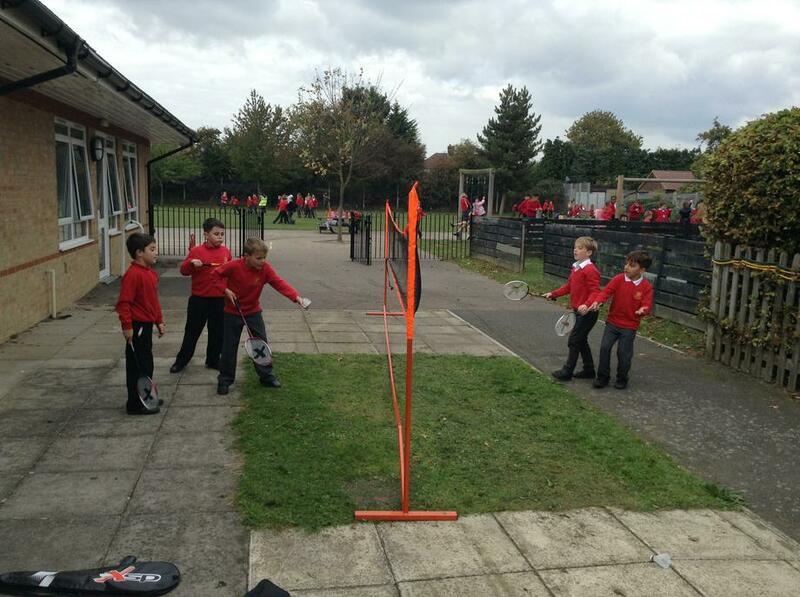 The children had to demonstrate a range of tennis skills to complete the tennis circuits, working together as a team. The children showcased some impressive skills and put 100% effort in to ensure they completed all of the mini competitions. Finally, a huge well done to our year 5 and 6 athletes who competed in the level 2 Quadkids competition at Erith Track. All of the children had to partake in a range of athletic activities such as: long distance running, sprint, standing long jump, howler throw and relay. The children showed great team spirit and dedication during some of the tougher events, such as the long distance run, and we were extremely proud of the way the children supported and congratulated one another. The lunch clubs for this half term will be basketball, cross country and athletics . Please book your place on the sports notice board. The children have competed in our first level 2 Tag Rugby competition that was held at Hurstmere Secondary School. They competed against many other school in Bexley and ended up 9th in the competition. Considering the children only had limited knowledge of tag rugby they did Fosters proud by showing such great sportsmanship and the development of skills throughout the whole competition. We are looking forward to our up and coming Cross Country competition and will keep up updated on the results. Well done to all of the children who competed in the level 2 cross country competition where we came 10th as a team!! Also, a huge congratulations to our year 5 and 6 footballers who made it to the finals of the Minor Cup, which took place at Goals in Bexleyheath. After a very exciting and tense football match Fosters were awarded the runners up trophy!! The lunchtime clubs that will be available for this half term are gymnastics, netball and football. Please book your place on the sports notice board. This half term we entered into the level 2 High 5s Netball Tournament against a range of schools across the Bexley Borough. The team have played extremely well showing skills such as determination, dedication and team spirit. As you are all aware we have now started the Foster's Golden Mile. This is a fun initiative aimed to encourage and inspire children within the Fosters community through physical activity. The initiative is fun and focuses on rewarding personal achievement and school competition. So far the Foster's Golden Mile has been a great success. We have some children who are getting close to gaining their bronze certificate which is awarded for running the length of a half marathon (208 laps). We will keep you updated on the children's progress. Year 4 and 5 World Cup with Mr Lee. Year 5 and 6 high 5's netball with Miss Cudworth and Miss Pilot. 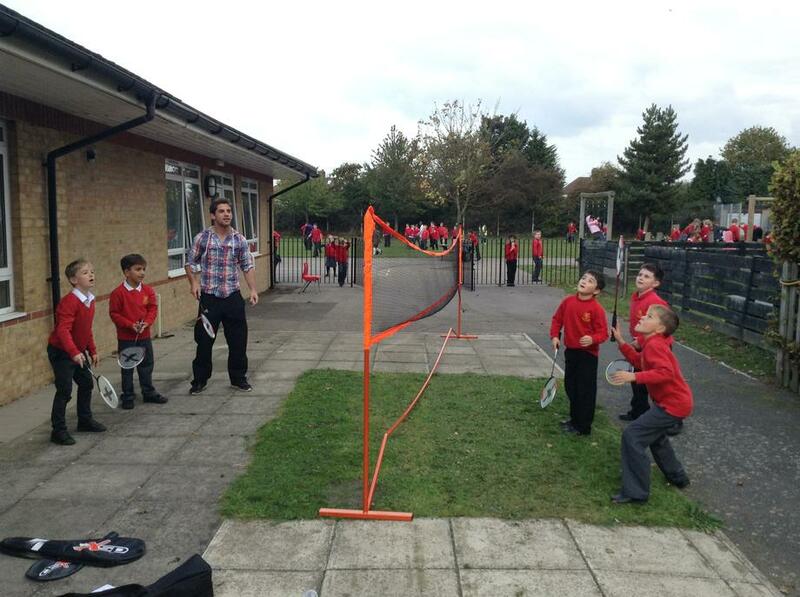 Year 3 and 4 badminton with Miss Cudworth. 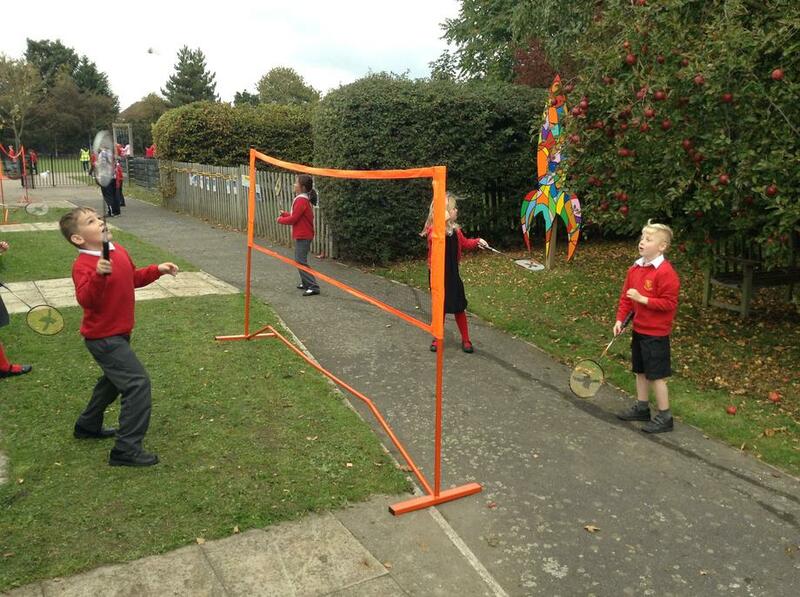 Well done to all of the children who competed in the intra badminton competition. All children received a point for their specific house teams. Year 4 and 5 American football with Mr Lee.